We Portlanders can't get enough of being outdoors -- rain or shine. But nothing beats sunny Oregon days, and we're all a little lacking in Vitamin D. Disc golf is a super-fun, low key way to spend some time out in nature, getting some mellow exercise and unwinding as you walk the course and throw some discs. Many of the course are tree-covered too, so a rainy outing certainly isn't out of the question. Unlike its equipment- and cash-intensive, club-swinging distant cousin, disc golf has a very low barrier to entry. You need a plastic disc or two. That's it. Most courses are free, and there are oodles of them all over Oregon and Washington, with a good dose around Portland. No tee times, no excessive water waste, pesticides or lawn manicurists required. Sounds like a great way to spend a half-day to me. 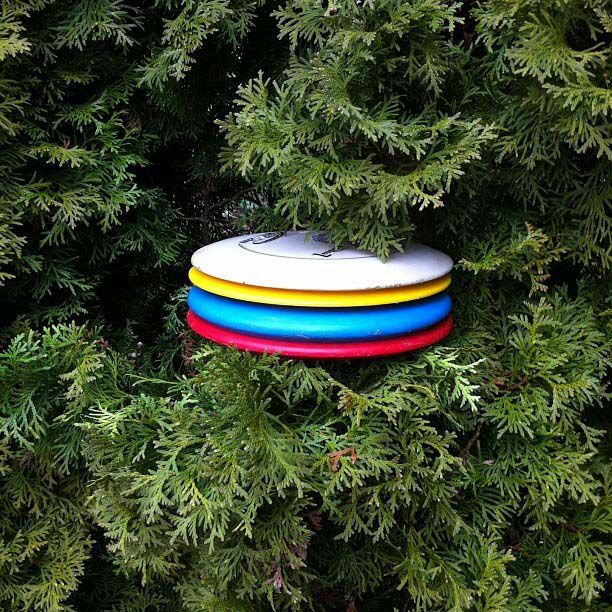 Below is a list of 10 disc golf courses in and around Portland, as well as some links to local organizations that support the sport and shops that sell golf discs. Pier Park is a huge, beautiful park in North Portland with rolling hills and plenty of tree cover. The trees make for additional obstacles, but the "holes" (actually baskets, for disc golf) are a mix of short distance and long distance. Pier Park is considered a great place for beginners, but experts frequent it as well. No alcohol allowed, but leashed dogs are. The 21-acre course surrounds a local church and parking lot, but the course is open to the public (obviously, be respectful). Golfers can tee off from a short or long tee position. Leashed dogs are allowed. This is the closest course to downtown Portland. This 9-hole course located west of town, in Beaverton, is contained in a nature park, which means a bucolic setting. It also means there can be ample pedestrians, so take care not to pelt passers-by. Just south of Marine Drive and the Columbia River, Blue Lake is a great -- but nearby -- escape from the city. In addition to the natural beauty, its location near the river means it can get a bit windy, adding extra challenge to your throws. The course is also known for its length, so be ready to air out some long drives. Champion disc golfer and University of Oregon team coach (yes, apparently it's a collegiate sport) Dave Feldberg designed the Blue Lake course, and the Professional Disc Golf Association has bestowed it with gold accreditation, the highest level for a course. No dogs allowed. Hillsboro's disc golf course features a cherry orchard on its first three holes as well as a tough, "signature" seventh hole. Volunteers worked with the city to make the town possible, and public events such as weekly "Tuesday Twos" keeps the community spirit alive. Dogs must be leashed; no alcohol allowed. Horning's Hideout in North Plains, Oregon, has three full 18-hole courses, and one of them is rated in the top-10 for the country by Disc Golf Course Review. Make a family day of it with fishing, hiking and paddle boats, or stay for longer and take advantage of the campgrounds. Most courses are alcohol-free, but McMenamin's Grand Lodge will be more than happy to have you drink their beers, wine or booze as you tackle your round. On Thursday through Saturday evenings, your game will also have live music as a backdrop. Check the website for scheduled course closures during the summer months. Rockwood Park's relatively short holes make it an ideal course for beginners to master their throws. The course does get crowded with pedestrians and families hanging out in the fairways, so throw with care. No alcohol allowed. Vance Park is very close to Gresham's Rockwood Park -- you could easily combine the two for an 18-hole day. Lots of trees lining the fairways make for plenty of obstacles. The Dabney State Park disc golf course along the Sandy River is unique in that it's purpose-specific: the course is for golfers only, so you won't have to contend with pedestrians and picnickers No dogs allowed in park.